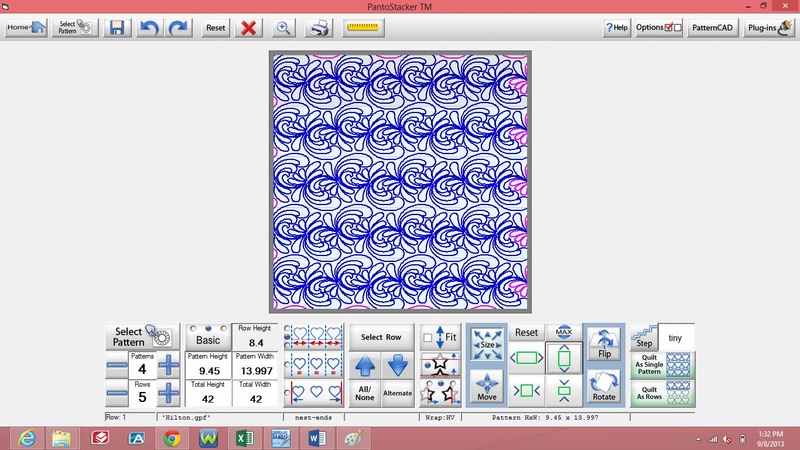 While Quilt Path does come with some digital designs, you will eventually want to add to your design choices. 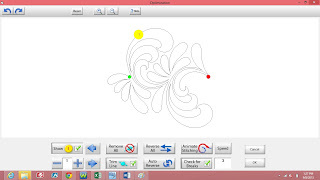 Today is the day we look at how to get those designs into the software so that you can use them. 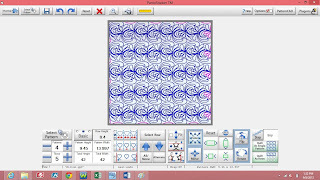 Quilt path can read from quite a few different file types. The ones that I use are qli (Statler) and cqp (Compuquilter). I have used both, my preference is to use qli if it is available. There are some import things you need to know before starting. First off I never search the internet or download designs on my Surface. I do that on my laptop or desktop and the save the qli file to a flash drive. Must companies download a compressed folder. Do not put the entire folder onto your flash drive. 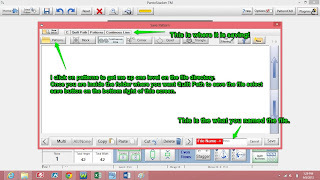 Quilt Path can not see inside a zipped(or compressed) folder. 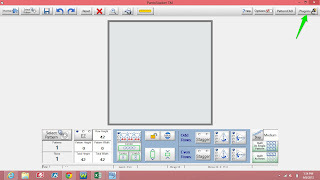 Save yourself a lot of frustration and just transfer the individual file to the flash. You should also think about where you want to save all the digital designs that you purchase. For instance, I put them all in a folder on my network storage device so that I know that are all together and that I have a backup of that location. I want to make sure I can get to them if I ever need to re-import one. Once you have the single file on your flash-drive, safely remove it from your computer and take it over to your Quilt Path and insert it into the USB hub. To bring the file in you need to be the Pantostacker. Now you need to navigate to your flash-drive. 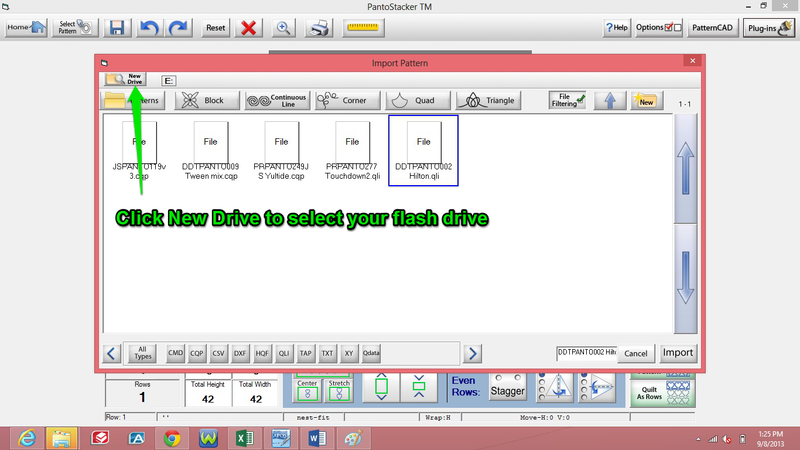 Select the New Drive button, it will list all the drives attached to your tablet. Like your computer, C drive is the hard-drive on the tablet itself. My flash-drive is normally listed as D, but yours might have a different drive designation depending on which USB part you plugged your flash-drive into on the USB hub. 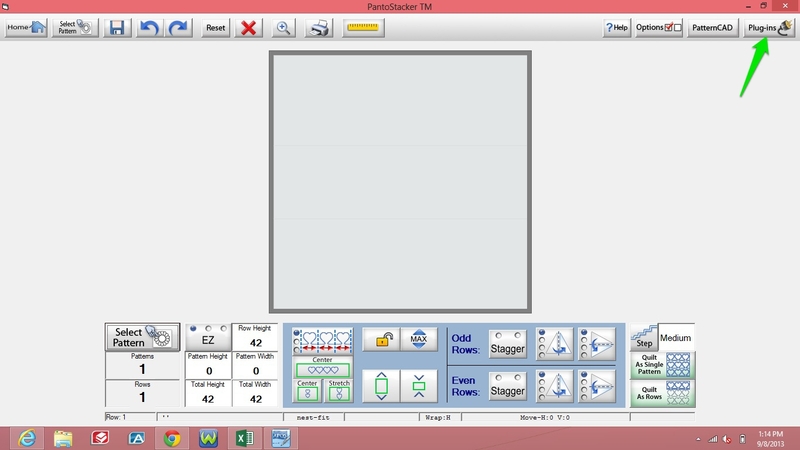 Once you select the file and select the Import button, the Optimize screen will appear. When you click OK, you will be taking to the Save Import screen. 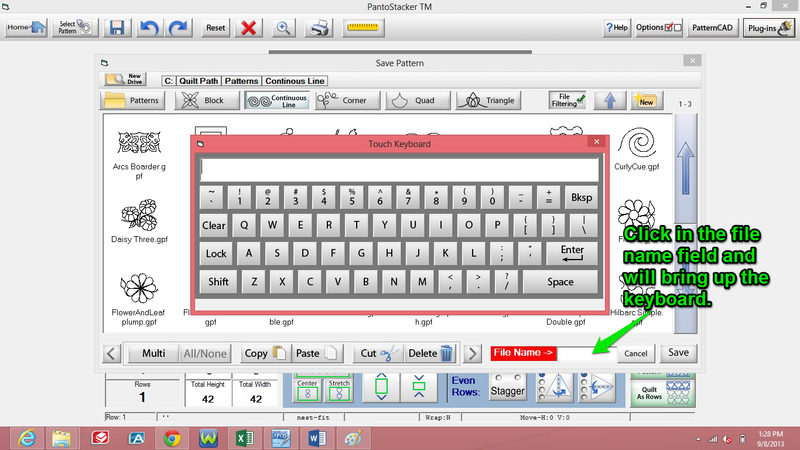 You need to click in the file name field on the bottom right and then a keyboard will come up. 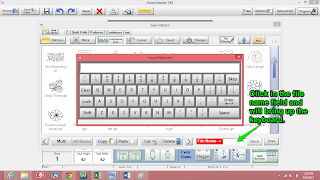 Once you select enter on the keyboard you will be taken to the save file screen. Not that on the bottom right the file name Hilton is displayed. That is the file I am currently importing. 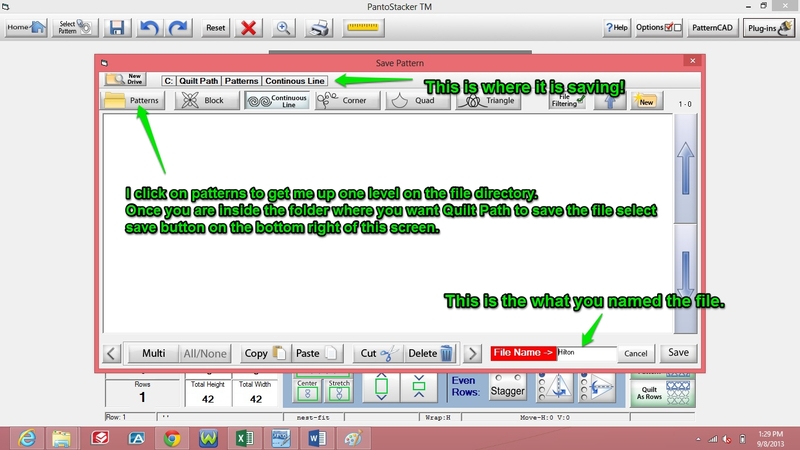 You will also see the path to where my Quilt Path is going to save the file at the very top of the screen. But that is not where I want to put the file. 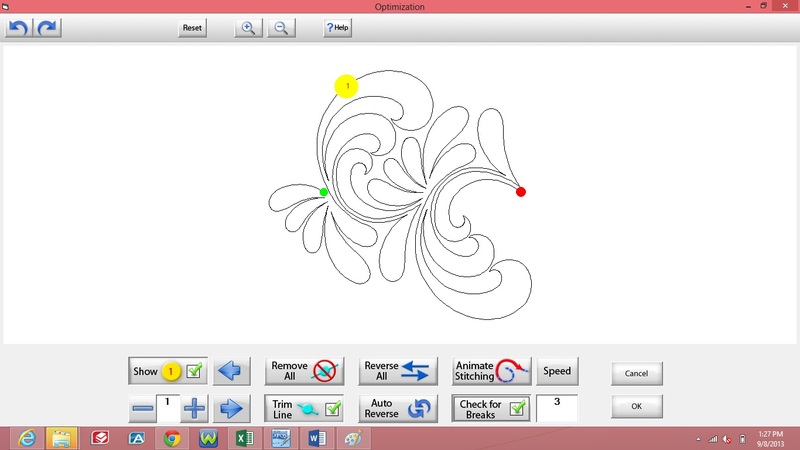 I like to organize my designs so that I can find them later so I would select the Patterns button and then navigate to where I do what the file saved. Once I am inside the folder where I want Hilton saved I will select the Save button on the bottom right. Now Hilton is available for me to use on whichever quilts that I want to. This is one of my favorite designs and is available at Urban Elementz! Thank you, thank you, thank you! I know others will benefit from this post as well. Need to print and have it at hand for the next download. I know you will miss my phone calls for help. Thank you for this. It really helped me!!! !